Free Customer Services Assistant Cover Letter Examples. A customer services assistant will be dealing directly with customers most of the time. This means that it is important to highlight any experience that you have had working with customers. This could be anything from working in a shop or restaurant to talking to clients on the phone or sealing with them by email. Qualifications are not always essential but if you have NVQ’s in customer service then make sure you highlight them as well. GCSE’s can also be worth a mention especially A-C grades and English and Maths as these show you have a good basic education. You will need to be able to handle complaints calmly and politely and so if you have any related experience doing this, then make sure that you mention it. You will need IT and numeracy skills so any related qualifications or experience should also be included in the cover letter. You will need to work with a team and have good communication skills so if you have had any work experience that included this, then explain it in the letter. You may need to have good written communication skills and so you need to make sure that your covering letter is well presented, in order to demonstrate this. I have waited a long time for an opportunity to work in a role such as this for your organisation, and I know hope that you will seriously consider my application for the vacancy. I enclose herewith my completed application form and a copy of my CV. The majority of my experience has been within the Customer Services industry, and I am confident that I would prove to be an excellent employee for you with my understanding that your business is about offering good quality products to a wide variety of customers and ensuring that each and every customer goes away satisfied with the service provided. I thoroughly enjoy being part of a busy team. 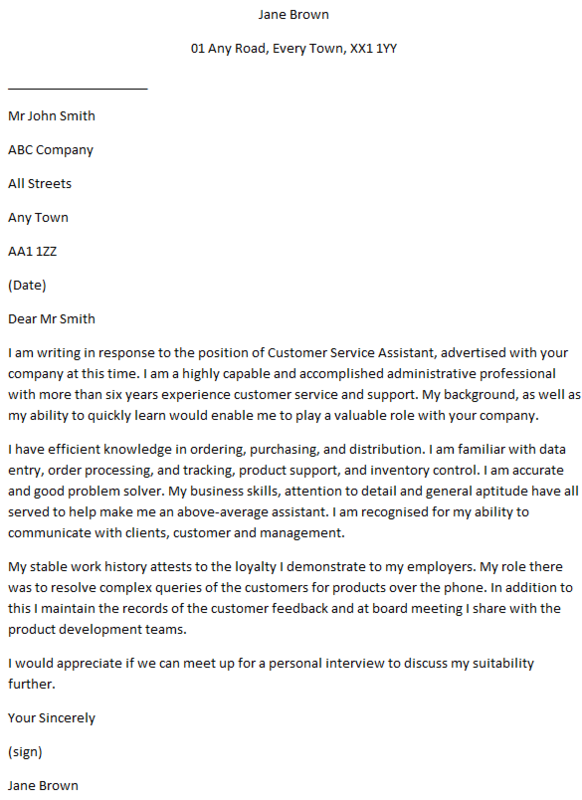 I am writing in response to the position of Customer Service Assistant, advertised with your company at this time. I am a highly capable and accomplished administrative professional with more than six years experience customer service and support. My background, as well as my ability to quickly learn would enable me to play a valuable role with your company. I have efficient knowledge in ordering, purchasing, and distribution. I am familiar with data entry, order processing, and tracking, product support, and inventory control. I am accurate and good problem solver. My business skills, attention to detail and general aptitude have all served to help make me an above-average assistant. I am recognised for my ability to communicate with clients, customer and management. My stable work history attests to the loyalty I demonstrate to my employers. My role there was to resolve complex queries of the customers for products over the phone. In addition to this I maintain the records of the customer feedback and at board meeting I share with the product development teams. The accompanying CV should serve to give you an idea not only of my past achievements but of my potential for making a significant contribution for your company. I would appreciate if we can meet up for a personal interview to discuss my suitability further. New letter examples has been added to this thread.